The Africa Brand Index (ABI) has named SABC3's Expresso show as the number 1 television show in Africa. ABI is one-of-a-kind social media currency that measures how brands communicate with audiences on social media in South Africa, Nigeria and Kenya. For the month of June, Expresso came in at number five overall but topped all television shows to be the number one on the list. 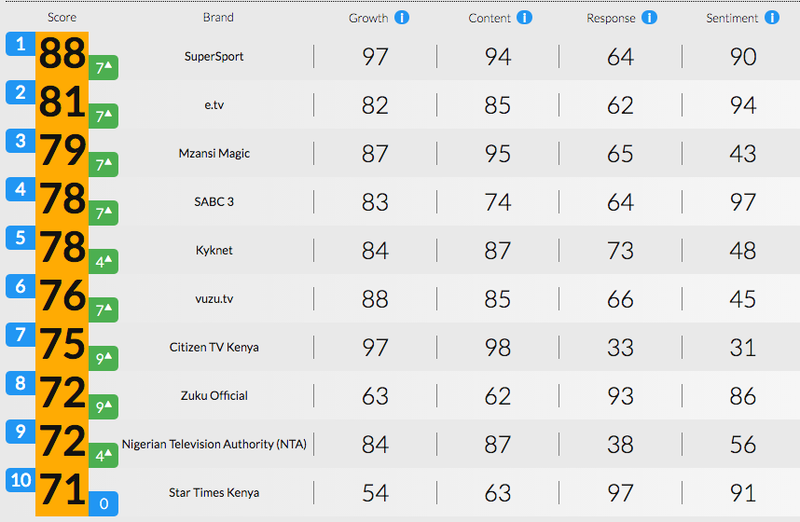 The number one brand on the list is the Sports channel Supersport followed by Nigerian bank GT Bank, Safaricom and DSTV South Africa followed at number three and four with Woolworths, Cell C, Jumia Nigeria, Kenya Commercial Bank and Vodacom trailing behind Expresso in the top 10 in that order. Expresso tops the top 10 of TV shows and is followed by Top Billing at no.2. The rest of the list includes Mnet's Carte Blanche and SABC's Soccer Laduma with 7de Laan at number five being the top rated soapie. In terms of television channels at large, Supersport leads the pack followed by etv, Mzansi Magic, SABC3 and KykNet in the top five channels on the list. 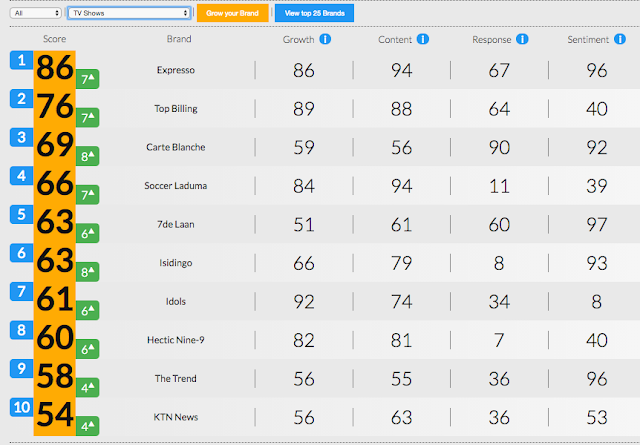 The Africa Brand Index, created by Ornico, uses an algorithm that scans performance in terms of growth, engagement, response, and sentiment across Facebook, Twitter, YouTube, and Instagram and ranks each metric across brands into a score from 0 to 100. Each of the 4 main scores (growth, content, response, sentiment) are combined according to their weighting into a single final score for the month. Basically what this means is that, the brand does not have to trend all the time. It is the engagement beyond just one topic or day that gives the brand the score. Also important is the conversation around the brand actually involving the brand's account. It is one thing to post about Our Perfect Wedding and have it trend but it is another when that conversation actual involves engagement from the actual shows account and hashtags created by the show's account. The algorithm will pick up on information relating to the show's hashtags and account name.